Dairy cattle of all ages can be managed well in naturally ventilated housing for optimum growth, milk production and breeding. The effectiveness of natural ventilation depends on wind (speed and direction), orientation of the structure, elevation and site conditions, structure type and size, attached structures and other possible obstructions. 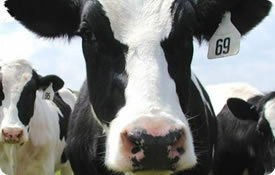 In dairy housing buildings, ventilation consists of removing bad, excess moisture laden and warm air and replacing it with fresher, drier and cooler air. Therefore, outlets and inlets are the two basic components needed. Outlets are typically placed at the centre of the structure and along the higher peak or ridge of the building. These outlets can be continuous slot type opening or the more common, intermittent chimney vents. The number and size of these vents is based on the structure size, insulation value level and of course on the number and size of the dairy cattle housed inside. It is important to note that these ridge or peak located vents work well when the inside temperature of the building is greater than the outside temperatures. Inlet openings are located on the sidewalls of the structure and occasionally on the endwalls as well. Again, these are sized based on the structure and wall size as well as the number and ages of dairy cattle housed. The wall inlet openings should be capable of being adjusted according to the temperatures wanted inside the housing area. There are many products available for these wall openings. Most common, poly curtain materials are used and are available in several styles and operation methods from very basic roll-up only curtains to multiple split curtain systems with automatic temperature, humidity, position control, and even wind and rain sensitive control operation. In addition, sliding polyglass glazed panels, insulated curtains and panel systems are also available for these wall openings. The choice of inlets control product depends on the wall opening size needed, the project budget and personal preference. 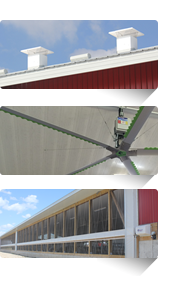 Sun-North has the experience and a wide variety of products to meet the needs of effectively ventilating all types of dairy housing structures.